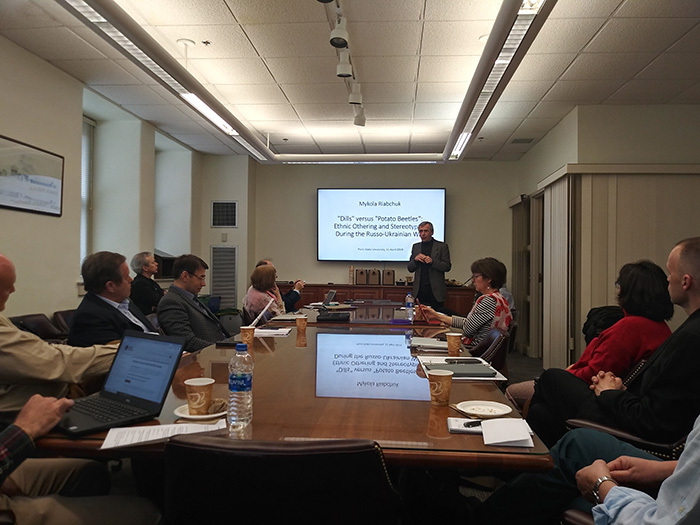 On April 11, 2019, Dr. Mykola Riabchuk, a Senior Fellow of the Institute of Political and Ethnic Studies of the National Academy of Sciences of Ukraine, took part in the international conference “Assessing the Euromaidan of 2014 Five Years Later: The State of the Ukrainian State”, at the Pennsylvania State University, State College, USA. 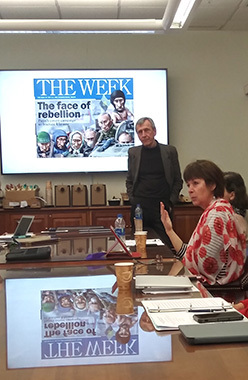 In his presentation entitled “‘Dills’ versus ‘Potato Beetles’: Ethnic Othering and Stereotyping During the Russo-Ukrainian War” he argued that the ongoing Russo-Ukrainian war, euphemistically called the “Ukrainian crisis”, has fundamentally changed both the established pattern of the Russo-Ukrainian relations and the way both nations (mis)perceive and (mis)represent each other. As always and everywhere, the major efforts of a war-time propaganda are aimed at alienation, disparaging, and dehumanization of the opponents-turned-enemies, so that the soldiers would not hesitate to annihilate them, and the society at large would feel no regret for the exterminated (non) human beings. These efforts, however, encounter some very serious discursive and institutional constraints. First, the warmongering propaganda on both sides has to deal with a firmly established myth of Ukrainian-Russian friendship and brotherhood – overwhelmingly supported by most Russians and internalized for centuries by many Ukrainians. And secondly, neither Ukrainian nor Russian authorities have a sufficient control over the information flows, even though the capacity of the Russian authoritarian government to manipulate the mass media and counterfeit the reality is formidable and, indeed, incomparable with that of their democratic and law-abiding Ukrainian rivals. 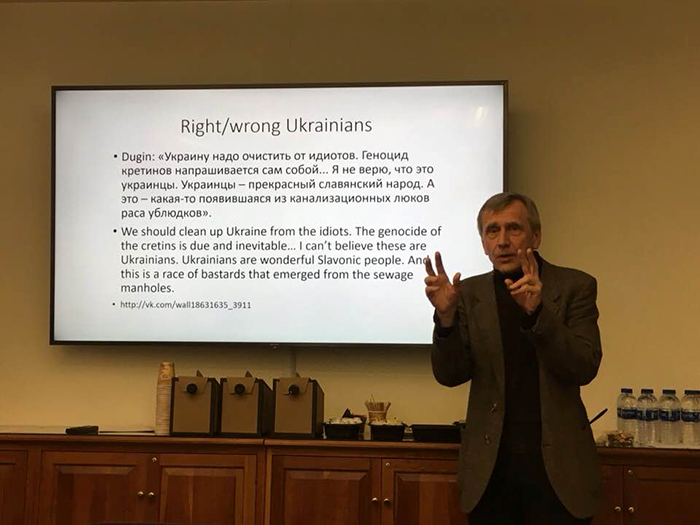 The both sides, none the less, have to take into account the already existing myths and stereotypes – colonial in the case of Russians and both colonial and anti-colonial in the case of Ukrainians. The new Russian mythmaking is largely based on the old dichotomy between the ‘good’ (‘right’) and the ‘bad’ (‘wrong’) types of Ukrainians, with the former increasingly being detached from reality and deposited somewhere in the ideal realm of imperial imagination, whereas the latter are increasingly belittled and demonized. The Ukrainian propagandistic strategies are more versatile and complex for at least two reasons. First, Ukraine – contrary to Russia – is a democracy, which means that the state has neither legal nor technical mechanisms to homogenize the information field, and the society is open enough to receive and freely discuss all sorts of information. 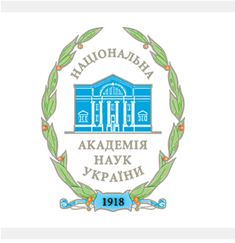 And secondly, the Ukrainian society is very heterogeneous, meaning that a substantial part of it had internalized, to various degrees, imperial myths and stereotypes and therefore cannot fully embrace the established anti-colonial narratives. To get rid of some colonial cliches entrenched in mentality and language patterns (like the notion of primordial “brotherhood”), many Ukrainians need, first of all, to question them and thoroughly deconstruct.